Low spots holding water are top bets for field-feeding ducks. This hole is holding some birds well after the morning flights. Dead leaves tumble across the wide expanse in the growing autumn wind. Trees with bare branches, frost-burned grasses and short days chase urban sun-lovers indoors. For them, the outdoors has died for another year. But the autumn renews the waterfowler's spirit, making him feel whole, filling him with warmth and excitement. Fall comes slowly, but the golden days are upon him before he knows it. To a duck hunter, this is the real season with honest weather. . .and the exciting world outdoors is never more alive. A reunion is about to begin. From the warmth of the duck camp to the shocking cold of the marsh, sportsmen welcome the change. At daylight, hunters strain to see shadowy phantoms in the vast darkness. Each location has its own legacy, providing a unique opportunity for sportsmen to enjoy the wonder of the outdoors. From the lingering green of early October until ice-up, hot spots are cherished by many. But in many cases, too many. If you are searching for less-crowded hunting spots, most parts of the country still offer plenty of places just like that. For less competition and, providing the preliminary work is properly completed, hot shooting action, try field hunting for mallards. Across much of the continent, autumn weather begins to get serious about the time the grain harvest concludes. That's also when big flights of migrating mallards join with locals and head to the grainfields for food. This takes place in late October in the North and great hunting is available until duck season comes to a close. In the North, summer-like patterns give way suddenly to harbingers of winter as Arctic-air rushes through Canada and on into the states. These early fronts bring nasty weather, complete with strong, cold winds often accompanied by light but miserable rain. They also carry the first major flights of mallards. Riding the rough-weather fronts requires frequent stops for food, and mallards go on a feeding frenzy. That's when field hunting for newly arrived ducks gets downright addictive. When huge flocks of mallards swirl in the autumn wind, dipping and rising as they work harvested grain fields, it can be every bit as inspiring as watching birds cascade into a classic marsh. Now, I'm not talking about just any field. My favorites are cut cornfields where feeding flocks in the upper Midwest are most likely to land. But wheat, barley and other small grains have similar effect on the big ducks. Good calling is less critical than good camo in the fields. The beauty of hunting these spots is two-fold. First, there are no other hunters around. Second, there are tons of birds available and you can count on plenty of shooting opportunities. Field hunting is also an excellent opportunity to introduce friends and relatives to the sport. With fond memories I look back on last year's season. After the excitement of the opener, hunting went downhill--fast. For several weeks I had a tough time finding birds. But that suddenly changed when I saw a flock of 500 mallards circling a cut cornfield. The landowner quickly agreed to our afternoon request and soon we were in duck heaven with birds locked up on our silhouettes. Flock after flock zoomed into our spread. Wow--was it ever fun to have such big numbers of birds "kissing close!" Birds tumbled to our shots, but we were even more excited to see flocks of hundreds of mallards circling closer and closer. By the time I announced, "Take 'em!" we were shaking so badly we missed some easy shots. But, the action was furious and many more flocks tried our spread. Besides, the pleasure of duck hunting in field or marsh is not how many birds you take but rather how you play the game. There are a few strategies you can use to turn the tables in your direction. Begin by finding ducks, of course, and that calls for plenty of scouting. Start with learning the flight patterns of local ducks, and determine the time birds fly and which fields they are using. Ducks often switch fields because of hunting pressure and where grain is being harvested. Top areas are always changing, and the successful field hunter must be mobile and constantly on the lookout for new hot spots. Don't make the mistake of hunting the next field over or going to a spot where birds were feeding two weeks ago. Find the exact location where birds are actively feeding and pinpoint the precise terrain where they are landing. Set your decoys in the exact spot birds are using. This strategy means you do not build a blind or dig a pit. Few farmers want you digging holes in their fields anyway, so a mobile approach is the key to success. A blind will keep you pinned down in one spot. When mallards are really into feeding, they'll hit the fields twice a day. Evening shoots can be just as good as morning hunts. Of course there are places where you are confined to one or several fields. Do not let that deter you--a good caller with plenty of decoys can set up in the feeding flyway and still have a very good chance of killing ducks. Do what you can do. My blind is based on one important factor--good camouflage. I wear camo clothing that is a good match with corn stubble. Most DU patterns work, especially a corn pattern; marsh brown camo is okay. I've seen hunters do very well wearing carhart coveralls. I'm also sold on painting my gun, even if it is a $900 Benelli autoloader. I believe the combination of full camo and grain-colored clothing is a deadly combo. Now, all you have to do is set decoys and lie on your back as birds dive for the spread. Oh yeah, it is a good idea to remain motionless as birds circle, which they tend to do much more over a field spread. The turn of your head following flights or quick movement when calling is strictly prohibited. In the field, you are more "open to criticism" from above. In truth, field birds will pick up the movement and work other parts of your field--which can be extremely frustrating--or head elsewhere. The slightest movement is easily noticed when you have several hundred ducks circling overhead. Whether you have full-body decoys, silhouettes or water blocks, the key to success is numbers. The more decoys you have, the larger the spread, the more birds you will attract and the better you will sucker big flights of ducks. Obviously, the best way to transport a huge spread is to drive to the area you plan to hunt. On occasion, it is a good strategy to use a few goose decoys. I mix a half-dozen Big-Foot full-bodied Canada decoys at the upwind side of the spread. I've tried every conceivable decoy for this brand of hunting and they all work. Floaters draw ducks like a magnet when set on a puddle of standing water in a field. Shells work great, especially in fields with little cover. Full-bodies are dynamite but expensive and difficult to carry. My most productive field setup consists mostly of several-dozen mallard silhouettes. Most are made of UV-resistant vinyl, which is much tougher than ABS or Styrene, has a non-glare finish and photographic realism. I set them out in feeding groups of two to four dozen, with openings throughout the rigging and watch the ducks cup their wings and dive into the spread. One fun thing about field hunting is you do not have to be an expert caller and you can blow your call like crazy. Seldom do you have to worry about call-shy birds--mallards feeding in a field are noisy by nature. Two hunters blowing high balls in rapid succession is a great way to bring distant flocks into range. Once birds swing close, switch to feeding chuckles and watch their landing gear drop down. While tradition dictates that any waterfowler worth his salt should be afield before sunup, this is not necessarily the best idea for field outings. Long-time gunners have learned that late-fall ducks often swarm fields at sunset. When the long days of luxuriant warmth in early season give way to snowy lakes chopped with brutally cold wind, shift your attention to harvested grain fields. 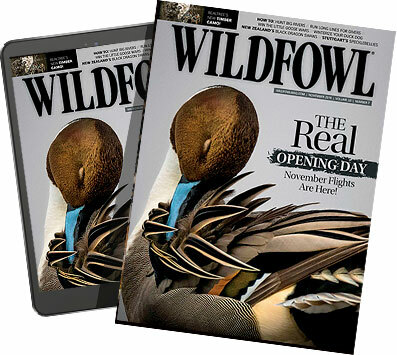 I promise you--if your waterfowling dreams are about migratory flights and barking guns, this brand of hunting will live up to your wildest expectations.